Between Football and all the upcoming Holidays, THIS is the time of year most of you are likely to fall off your healthy eating regimen and get a little lazy with those fruits and greens, due to the seasonal changes and shifts in temperature. Have no fear…THE BALANCED BEAUTY SOLUTION IS HERE — it’s: ATHLETIC GREENS! This is a green drink formula I have personally taken every single day for the past 10 years. It is the only supplement I depend on to fortify my body and immune system, to keep it functioning and metabolizing at its most optimum level. It is also the ONE and ONLY product I recommend to my clients. 1 scoop with water in the morning before meal-time and you are set for the day! 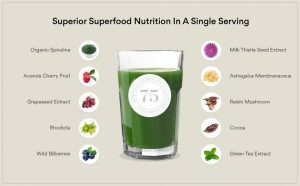 With 75 ingredients, The Athletic Greens ingredients list is long, but you’ll find NO harmful chemicals, artificial colors, artificial flavors, preservatives, artificial sweeteners or added sugar. NO GMO’s, herbicides, pesticides, wheat, dairy, gluten, corn, lactose, sucrose, dextrose, egg, yeast, peanuts or animal products. 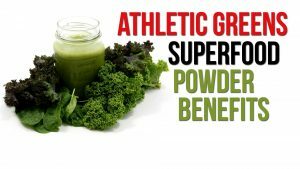 Athletic Greens has developed the most nutrient dense, gut-health-improving, great tasting, once-a-day, all-in-one whole food supplement available. Aside from being loaded with vitamins, minerals and probiotics to keep your immune system healthy and supported- it is mainly designed to IMPROVE YOUR GUT HEALTH. Did you know when your GUT is healthy and strong- that is when you are able to most efficiently burn fat, lose weight and have a boosted metabolism?… So many young girls and women have come to me over the years with their metabolism wrecked after taking chemical-filled diet pills or supplements made from harmful ingredients. It’s time to heal your body! … It’s time to fuel it with food from the earth and a supplement that can help strengthen, support and take your health goals to the next level for optimum energy and functionality. Aside from GUT HEALTH being important from a metabolism/weight loss perspective, its also crucial from a mindfulness, spiritual and thinking perspective- Why? You ever hear someone say, “GO WITH YOUR GUT” — The expression exists for a reason! That “gut-check” feeling aka “go with your instincts” is your body’s main way to help you make clear and rational decisions. Using your GUT is trusting your own inner intelligence and guidance system; tapping into your own personal “knowing sense” and PERSONAL POWER!! !… When your gut is clear, healthy and working properly your decision making abilities are much more clear. I believe, the cleaner the gut, the higher your intelligence ( I am certain scientific studies will go on to continuously support this theory over time- go ahead and quote me now)! 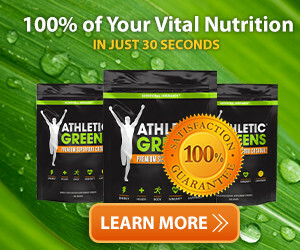 The Athletic Greens formula supports your body in 3 ways: NOURISHES, ABSORBS & SYNTHESIZES. Naturally occurring enzymes that bolster the digestive process and enhance nutrient absorption. Our liver supporting formula helps process and remove toxins, and can aid in fat loss. High quality prebiotics and probiotics provide effective immune system support. The human body requires the right combination of essential minerals and fatty acids to efficiently process carbohydrates and properly utilize insulin for the management of blood sugar levels. A daily serving of our greens powder provides support in both. 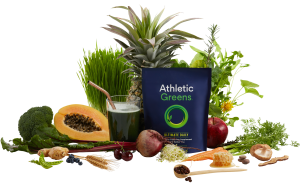 Athletic Greens is a formula designed for men/women who are striving to live life at an optimum level. In just 1 scoop, it provides your body with everything it needs to run efficiently and have you looking and feeling your best from the inside out. I always preach: your health is everything, you only get one body in life and it is crucial to treat it in the best possible way. Investing in your health is the smartest things you can do, because when you feel good- you have the energy to do the things you love to do and need to do. 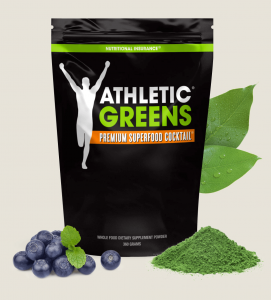 Athletic Greens supports my metabolism, overall health and was the key ingredient that aided my recovery when running the ING NYC Marathon- 26.219 miles! I can go on-and-on about why I support this company and love this formula because I truly believe in what they are doing to help us function to feel our best. I encourage you to give them a try, especially during the upcoming cold/flu season months– It’s a BOOST your body will need and thank you for! When purchasing through any of the links, in this Blog or on the site, Email me your confirm and you will receive a Complimentary 1:1 Health Coaching Session with me! Let’s create some healthy goals and keep you accountable to that healthy, thriving lifestyle!!! How many of you buy $10 green juices, smoothies or 2 coffees/day to boost your energy? This formula may seem expensive up-front but it is meant to REPLACE those other items, saving you money, time and energy in the long-run…. Try it out for yourself and thank me later when the weight flies off, you feel your best and maintain your healthy glowing appearance over time. If you forget this Blog in the future- Remember, you can also head to the SHOP page on the main site! Or Follow along @1BalancedBeauty for future posts and details!